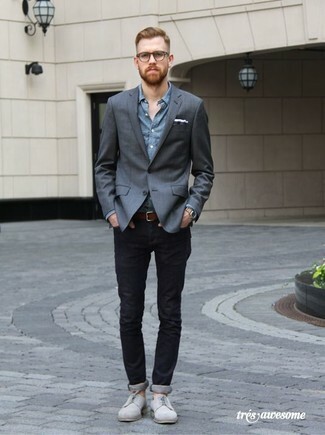 For something more on the casual side, try this combination of a grey wool blazer and a brown leather belt. 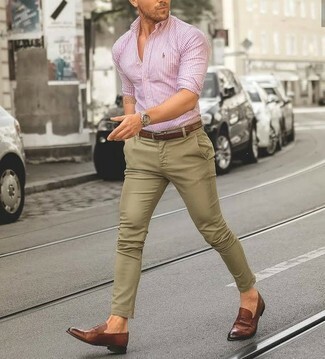 And if you want to immediately spruce up your getup with one single item, why not complete this outfit with a pair of dark brown leather brogues? You'll be surprised at how easy it is for any gent to get dressed this way. Just a grey wool blazer worn with a Bosca Heritage Leather Belt. 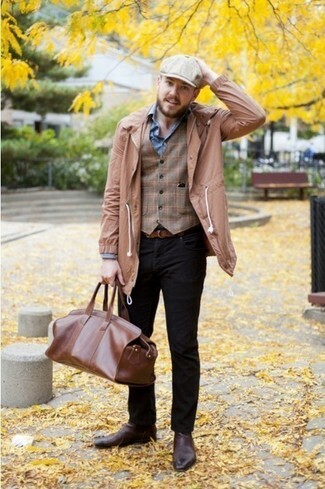 A pair of brown leather brogues easily ramps up the fashion factor of any ensemble. A navy shawl cardigan and a Bosca Heritage Leather Belt from Nordstrom are amazing menswear pieces to have in your off-duty repertoire. If you feel like dressing up a bit, opt for white low top sneakers. If you're all about comfort dressing when it comes to fashion, you'll love this stylish combination of a black long sleeve henley shirt and a Bosca heritage leather belt from Nordstrom. Tap into some David Gandy dapperness and complete your ensemble with dark brown leather loafers. The versatility of a black blazer and a Bosca Heritage Leather Belt guarantees you'll have them on regular rotation. Black suede loafers will easily polish up even your most comfortable clothes. Wear a pink vertical striped dress shirt and a Bosca Heritage Leather Belt from Nordstrom if you're after an outfit idea that conveys casual street style style. 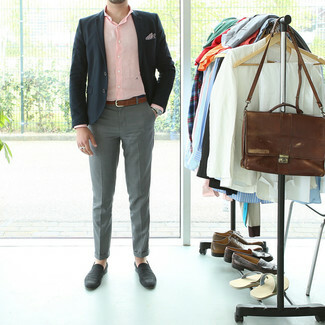 Dial up this ensemble by wearing brown leather loafers. A black cotton blazer and a Bosca brown leather belt are a nice pairing to add to your daily casual fashion mix. A pair of white and brown suede oxford shoes easily steps up the fashion factor of any look. This casual combo of a charcoal blazer and a Bosca brown leather belt is extremely versatile and really up for whatever adventure you may find yourself on. Complement your look with grey suede derby shoes to avoid looking too casual. If you prefer relaxed dressing when it comes to fashion, you'll love this easy pairing of a tan trenchcoat and a Bosca heritage leather belt. Make brown leather chelsea boots your footwear choice to kick things up to the next level.